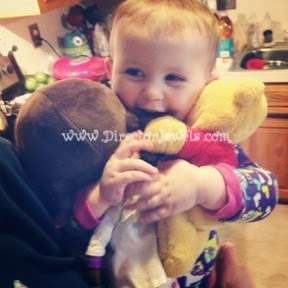 Director Jewels: Winnie the Pooh and McStuffins, Too! My kids are a little bit obsessed with Disney. That's not a huge secret. I mean, I ponder about the minds of the characters and give away tickets to the Kansas City Disney on Ice show. It's not a normal day around here if we don't play with a princess or a Lightning McQueen. Addie has two favorites right now that seem to have earned their place of preference over all toys: Winnie the Pooh and Doc McStuffins. We've been sick for the better part of a month (someone, please send spring), so there has been a lot more TV-watching than normal around here. And this little girl of mine thinks she is entitled to watch Pooh and Doc around the clock. Honestly? I don't mind. I love them both, too. Our TV time is on the decline since we are (finally) feeling better and can play outside in the warmer weather, but I'm still excited about the newest Pooh and Doc releases. After all, I spend a lot of my time watching these shows, too! It's like Disney can sense how to make my kid happy. Do you know what two of the newest DVD/Blu-ray releases are? Winnie the Pooh: Springtime with Roo and Doc McStuffins: Mobile Clinic. 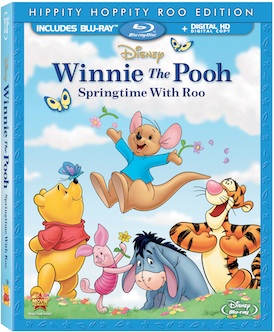 Addie saw the new Pooh DVD when we were shopping a couple days ago and declared "ROO!!!" No doubt it would be a hit. I am certainly ready for a new Doc McStuffins episode selection. We own two DVDs and have played them both nearly to death. I can sing the theme song in my sleep - and actually, sometimes Addie does that too. She doesn't say the words, but she knows exactly when to chime in with "Doo-doo-doo" and "Oh-oh-oh." It might be the cutest things ever. Today, we're singing Pooh and Doc McStuffins songs outside, but I'm keeping these new releases in mind for the next rainy day. Unlike most people, we don't have a cable subscription - so all of the episodes will be completely new to us when we view the DVD! Are you a Disney fan? What show or movie do your kids love?